I Accept Consignments and Buy Individual Pieces and Collections. The focus of this website, as well as this sales section, is German Third Reich. 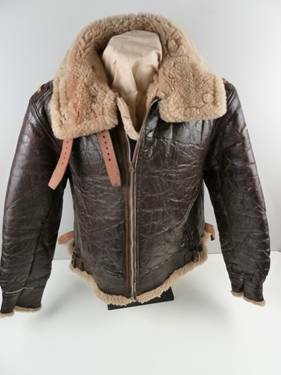 Occasionally United States militaria accompanies pieces that come in on consignment and those few items will be listed here. 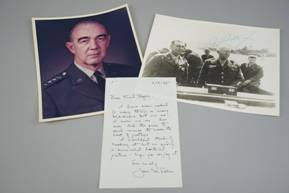 A group of photos and a letter originating from General James Polk and featuring a photo of Polk and Patton together, which is signed by General George Patton. Notes on photo back date the photo to May 19, 1944 on the 99th anniversary of the formation of the 3rd Armored Cavalry. Also includes a letter from Polk and a studio photo of him as Commanding General U.S. Army Europe and Seventh Army. 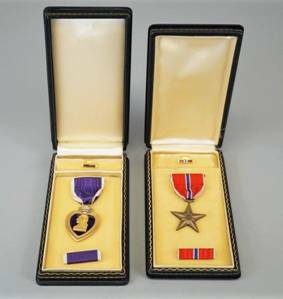 A cased Purple Heart and cased Bronze Star, both named to the same recipient. Both the awards and cases are in excellent condition. There has been no research on this recipient, so it’s a good project for someone. A cased Purple Heart and loose Bronze Star, both named to the same recipient. Both the awards are in very good to excellent condition. The Purple Heart case has a loose top edge, which can probably be glued. There has been no research on this recipient, so it’s a good project for someone. Complete uniform for a Lieutenant of Artillery in WWI, to include the four pocket tunic, breeches, piped overseas cap and brown belt and cross strap. Tunic and pants are made of a high quality olive whipcord wool fabric and in excellent condition with no visible holes or damage. One button has fallen off (but is in the hip pocket), otherwise it’s near perfect. Silver, beveled rank bars are pinned to each shoulder, the collar has black matte regimental and national insignia. 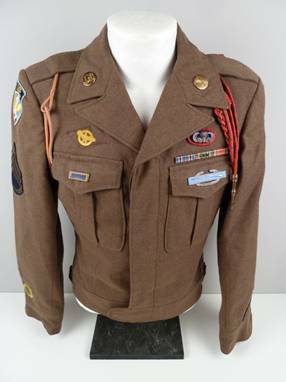 Comes with a WWI Victory medal and ribbon bar pinned to the tunic. Sidecap is a heavier wool material in a finer weave with red piping and a silver, ribbed rank bar pinned to the front left side. 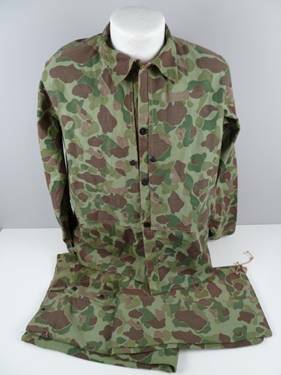 An absolutely mint, un-issued WWII Marine Corps camo uniform consisting of both the tunic and pants. Both pieces are constructed of lightweight cotton with reversible camo pattern. All buttons and snaps are intact and mint as well. The black metal buttons are marked “U.S. Marine Corps” on the top surface. The jacket has two snap-closure “grenade” pockets on each side. The pants have two side pockets with slit-closures on the green camo side and flap closures on the brown camo side. Incredible condition, looks like it was just issued yesterday. Very rare to find with the pants. This is a great piece from a true combat veteran with multiple jumps. The base jacket is a dual-patched size 38 brown wool “Ike” with the Ruptured Duck indicating this was worn after the end of hostilities, with rank insignia indicating a Staff Sergeant. The right upper sleeve patch is for the First Allied Airborne Army, the left sleeve has the U.S. made 82nd Airborne insignia. Most interesting is the sterling silver parachute jump wings with an oval backing indicating 505th parachute infantry regiment and three battle stars indicating three combat jumps. Rounding out the decorations are a Combat Infantry Badge, Presidential Unit Citation ribbon, a ribbon bar with an EAME sporting three battle stars, and Dutch Military Order of William and French Croix de Guerre lanyards. A very nice Airborne display piece to a seasoned paratrooper. Flight suit for wear by U.S. Army Air Force flight crews, consisting of leather jacket and leather pants. Both pieces show wear but are in overall excellent condition. Jacket is a size 44S and labeled Type B-3. Pants are labeled Type B. 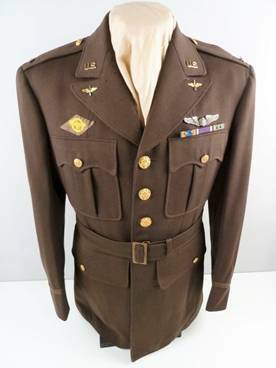 Dark olive drab four pocket service tunic for a Lieutenant of the 15th Army Air Force. Tunic has a army air force pilots badge affixed to the upper left breast along with a small ribbon bar. Above the right breast pocket is the “ruptured duck” patch. A very nice bullion 15th army air force patch adorns the left sleeve. No name inside. Tunic is in good condition, though there is some mothing to the lower right lapel and a few other random, pencil size holes throughout the tunic.